Allow The Children hosts missions trips each year for individuals, churches, Christian schools or general groups. Give you an opportunity to meet your sponsored child! Visit the mission field and see what the Lord is doing - and be a part of it. Do something that will count for eternity. Step 1 - Contact us for more information about upcoming trips for individuals or to arrange dates and a project for your group. Step 2 - Download the application forms to the right, complete and submit to us. Step 3 - After your application is accepted, we will set up an account in your name and you may seek contributions to help cover the costs. We will help with suggestions and a letter template for you to use when writing your letter. Step 4 - Get a passport! Download the application from the internet. If you already have a passport check to be certain that the expiration date is at least 6 months past the expected date of return from the mission trip. Step 5 - We will send you information about immunizations, travel medical insurance, what to pack, and additional details. What is included in the quote for the trip cost? The estimated cost quote includes air fare and everything related to the trip within the country such as ground travel, sleeping accommodations, meals, and project costs. It does not include: passport, immunizations, travel medical insurance (required), ground transportation to/from a US airport, food in airports or during air travel, excess baggage fees, laundry, personal health or hygiene items. The trip cost quoted is an estimate. If there is some unexpected event (for example, a delayed return flight), there could be additional costs involved. Go HERE to the U.S. State Department website to apply. If you have any questions, we can help you. We will send you a list of recommended immunizations and/or you can consult your own doctor. Yes. Very few health insurance policies cover international travel unless you have a special rider attached. We will give you contact information for companies we recommend. You will need to call and make the arrangement and payment. This is not included in the quote for the trip. Our board requires every trip participant to have travel medical insurance. What happens if I raise funds for a trip, but change my mind or some situation prevents me from going? Funds that have been received and tax receipted cannot be returned. The balance that has not been spent (for example, for an air ticket) can be kept for a future trip, applied to benefit one of the other participants or donated for the project. If this happens, we will decide something with you individually. We will send you a list of things we suggest to bring. Each person can (usually) pack one piece of luggage, under 50 lbs, and a smaller bag for carry-on. What is the project for the mission trip? Each trip is different according to the gifts and interests of those who participate. Some trips are planned around a specific project (example: construction). Some trips might have part of the group working on construction and another part doing children’s ministry activities. If you have a group who wants to do a specific project Contact us! What are typical or needed projects? Supplies: Most teams carry and distribute needed supplies such as donated clothing, vitamins, school supplies. Speaking: Preaching in churches, training pastors, Bible conference for women, Bible lessons for children. Skills: Use or teach a special skill that you have to bless the people: hair cutting, computer skills, crafts that can be sold, health/hygiene issues, others? Music: Minister in the churches with singing or instruments, music for the children. Work projects: Concrete construction, brick laying, painting, digging, cleaning, planting trees. Children’s ministry: Bible lessons, crafts, fill and distribute Christmas bags, new photos and progress reports for the sponsorship program. Medical: Mainly doctors needed, but others can help with supplies, organizing the people, distributing tracts. Can our church (school, college group) form our own group and make a trip? If you can recruit enough people, yes! The number of participants needed depends on the country and the project. Will there be another trip to Guatemala (Nepal, or other country) this year, other than those listed? There might be. We will list trips on the web site when they become definite, but one could be in planning that is not yet listed. Contact us! Is it too late to join a trip that is departing very soon? Many times we can add another person in late, if a seat on the flight is available. Contact us! Timberlake Christian School Seniors traveled to Guatemala with us in 2013 and four previous years, giving their Senior trip to making disciples for the Lord. They have worked with building projects, children in orphanages and villages and with the local village churches. In 2013, they built a small worship “shelter” for a small village where a Guatemalan evangelist is working. CONTACT US TO plan a trip for your christian school or group. The First Bible Church in Calexico, California joined us for a mission project in Guatemala in 2012. Again in 2013, they worked with our ministry in Nicaragua — pastor training, preaching in village churches and to the children. CONTACT US TO plan a similar trip. We need doctors for this annual medical ministry trip. 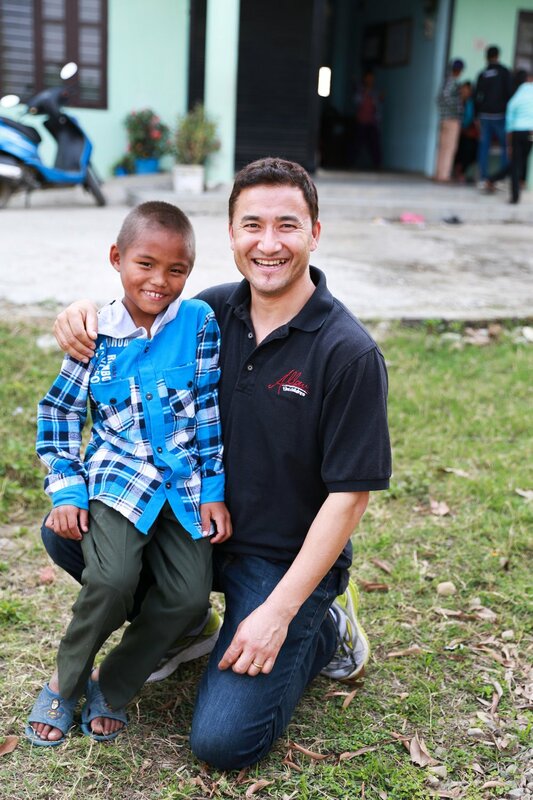 The team is led by a Nepali doctor who lives and works in the US. This trip is scheduled each year near the end of October and early November. If you are a doctor interested in going, we will help you contact him with your questions. This is our annual trip women’s trip to Nepal to gather the materials needed for our sponsorship program — new photos, progress reports, letters for sponsors. We need help! We also teach from the Bible at each stop as well as pack and distribute gift bags for every child. It is a work trip, a teaching trip and a fun trip. Come visit every church program and children’s home in Nepal with us. A group of young adults from Liberty University and other schools traveled to Nepal for a three fold project. They taught Bible to children in two of our children’s homes. They did a work project of painting and planting banana trees. The pastor who accompanied on the trip taught a 3 day seminary module to the Nepali pastors. Poverty is everywhere. Spiritually lost people are everywhere. Here is a chance to be part of doing something about it. We take this trip every year. Projects are planned according to the gifts and interests of the participants. We often have a building or painting project. We also plan teaching and crafts for children in the orphanage and/or villages. We serve food in the feeding center. We might distribute clothing or food in a needy village. Every trip is different. There is something to do and a way to help, whether you want to do construction or serve in other ways. Our annual Guatemala trip is for anyone; individuals or small groups, adults or teens traveling with a parent. In January, 2012 a group of men traveled to Nepal to build a church for the Maranatha Project. What a blessing to have the church open and in use now! The next phase of the project is to build a second floor for the children’s home on the same property. So many children need to come, but the space is full. We will be planning a men’s building team every year until the need is met. Contact us to join the next men’s building team trip to Nepal.